Designed to blur the line between the indoors and out, the TBGs event spaces and adjoining garden courtyards provide the perfect settings for wedding ceremonies and receptions, bar/bat mitzvahs, birthdays, anniversaries, showers and cocktail receptions. You and your guests will enjoy the added convenience of holding ceremony, reception and photography sessions all in one location. 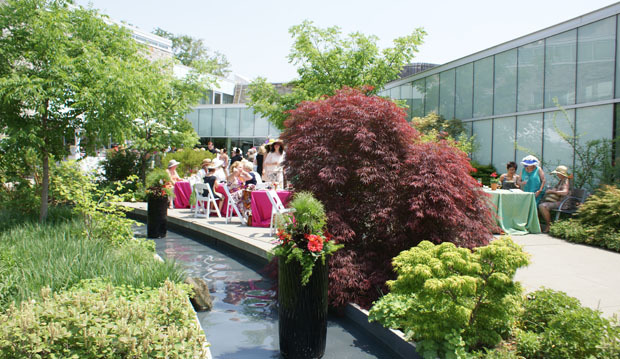 Our venue lends itself to unique and personalized events with our flexible décor, creative catering partners and a seasonally changing garden setting. Celebrate your milestone occasion and wow your guests in one of the most beautiful places in the city. Contact us to book an appointment and take a tour of our facilities.